Hello there, today is Wednesday so it's time for another Wonderful Wednesday with Stamping Bella. 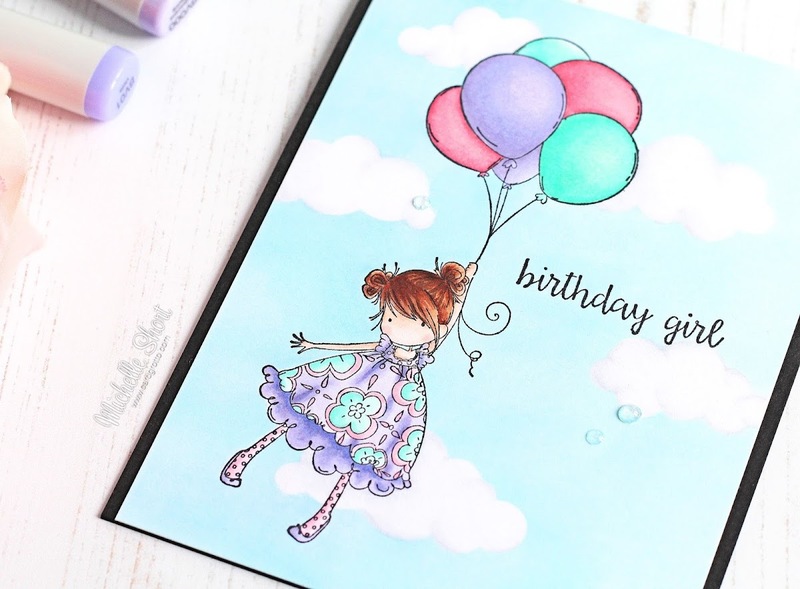 For my card today, I am using the super cute Tiny Townie Blossom Loves Balloons stamp set. I love the Tiny Townies collection. I started off by taking a piece of white cardstock and stamping Blossom on to it using Memento Tuxedo Black Ink. I then created a mask for her with mask paper. I also cut some clouds from mask paper also. These were added to the cardstock panel. I then used my Copic Airbrush to colour the sky. The masks were taken off and then the image and clouds coloured using Copic Markers. The panel was adhered flat to an A2 black card base with ATG. To finish off, I added a few accents with Nuvo Sea Breeze Jewel Drops. Here are the links to what I have used on the card. Please click on the picture or wording to be taken to where I purchased it. Affiliate links are used on some products. This means that if you make a purchase after clicking on my link, I receive a small commission with no extra cost to you. I truly appreciate your support when using these links. Products marked with an asterisk (*) were kindly sent to me to use. COPIC MARKERS - Skin: E13, E11, E00, E000, R20. Hair: E49, E29, E27, E25, E23. Dress: BG13, BG11, R83, R81, V25, BV13, BV11, BV01, BV00. Balloons: R85, R83, R81, BG13, BG11, BG10, V25, BV11, BV01, BV00. Isn't she cute? I loved colouring her in! 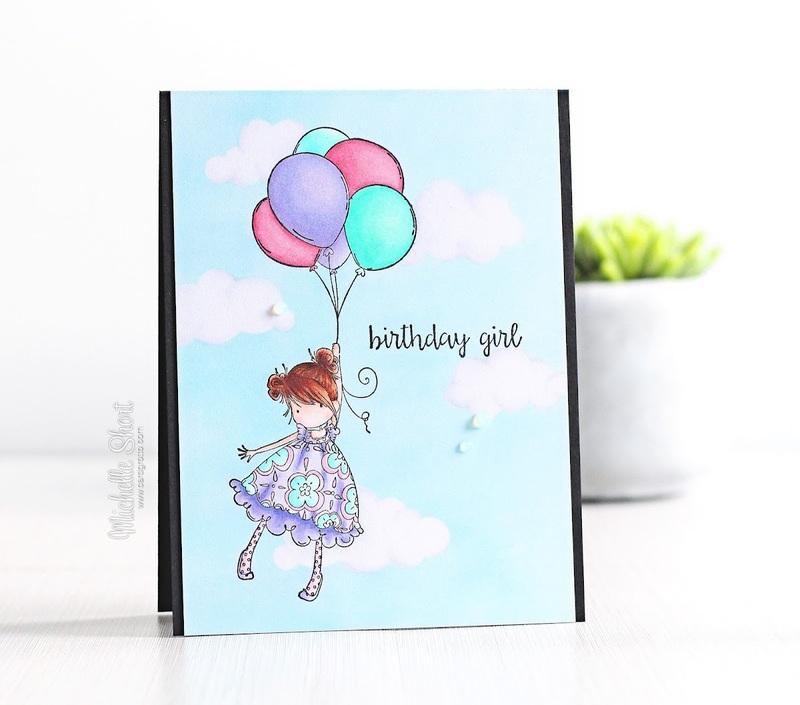 For more inspiration using Stamping Bella stamps, please head over to their blog. Thank you so much for visiting me today. I hope you have a great day! I love this sweet card. The colors are beautiful. Gorgeous card!! You've coloured her in perfectly!